Sixty-six countries later he has performed with more than 20 different companies, among them the Circus Monti for its 2011 tour (Switzerland), Adn Dialect (CH), the Teatro alla Scala (Milano), companies Bam, Entr'act and 36 du Mois (France), La Putyka (Czech Republic), Collectif and Then... (UK), and made some replacements in 7 fingers' Fibonacci Project and contemporary dance companies L'éolienne, Yann Lheureux (France), and Estelle Clareton (Canada). Raphael trained in Geneva's circus school « Théâtre-Cirqule » and at the national circus school of Rosny-sous-Bois (France), where he specialized in floor acrobatics, trampoline and single wheel. After graduating in 2008, he immediately set up for a nomadic life, eager to meet different acrobatics cultures and experiment as many ways of performing as possible. Raphael has also been invited to teach acrobatic movement workshops in places such as Geneva, Prague, Seattle, Wellington, Mexico, Cambodia, and Nepal. In 2016 he created his own company, «Compagnie l’Étranger», whose aim is to promote contemporary circus in Switzerland and Slovenia. 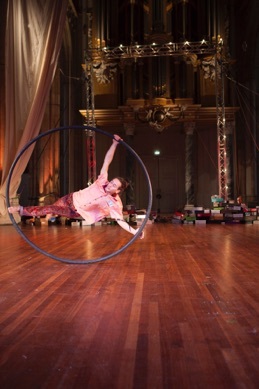 He currently works on the developpment of the company’s first creation «Zemlja», as well as with swiss company Comiqu’Opéra on a show mixing circus, magic and opera, which premiered in march 2019 in Théâtre du Passage, Neuchatel.